POINT BLANK RANGE IS GIVING AWAY A BRAND-NEW AR-15 AS A DOOR PRIZE! Have you ever felt the adrenaline rush of firing a fully-automatic submachine gun? Perhaps your trigger-finger is itching to fire one again? Either way, you're in luck! 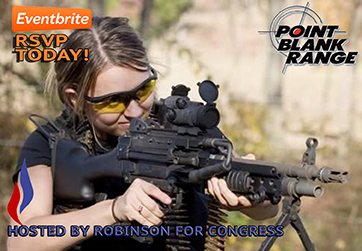 Vernon Robinson, conservative candidate in NC's new 13th district, is hosting another Machine Gun Social fundraiser, and you and your friends are invited. This will be the third MGS hosted by Vernon. Click here to RSVP and lock in your place in line! Your $50 donation includes one magazine to fire from one of 10 full auto SMGs. This event is first come, first served. Your place in line to shoot will be determined by when you register for the event. RSVP now to lock in your position at the front of the line for the night of the event. You and your guests must be at least 16 years old to attend and bring a valid photo ID. We'll supply you with the protective equipment and training you'll need to get on the range and FIRE! Forward this email to everyone you know who loves guns and the liberty we have in the Second Amendment. This is going to be a lot of fun, you'll meet great people, and we'll drive the liberals crazy. We look forward to seeing you next week. If you'd like to volunteer for the event or have any other questions, please contact Matt Miller at 803-814-4118. Don't forget to follow Vernon's campaign on his Facebook page! Support Vernon Robinson for the new NC 13th District and RSVP today for the Machine Gun Social fundraiser. Donate to the Grass Roots North Carolina's Political Victory Fund. What is the GRNC-PVF? By law, we are restricted from using organizational money to influence elections. The Grass Roots North Carolina Political Victory Fund is the tool we use to elect pro-gun lawmakers and throw out anti-gunners. The GRNC-PVF is North Carolina's federally registered political action committee. We use it to make political donations and to run radio and newspaper ads for and against candidates. If you can help out with a small contribution, we will use it to elect candidates who will defend your rights. Click here to donate.